The father of nine received a liver transplant in October at Cleveland Clinic, Abu Dhabi. The patient’s health significantly improved, and is on the road to recovery. 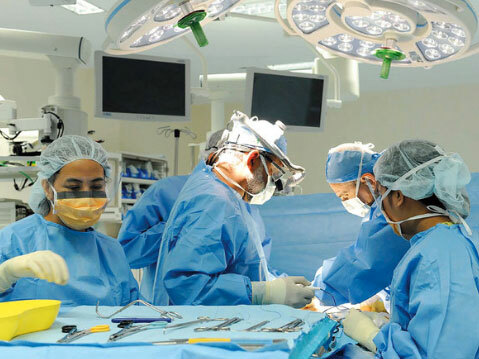 Abu Dhabi: Doctors have confirmed a significant improvement in the health of Emirati patient Ahmad Al Hadrami, who recently received a partial liver transplant from his son. Al Hadrami's surgery, which was carried out last October, was one of three patients to receive organ transplants from live donors within a week. Doctors at Cleveland Clinic in Abu Dhabi explained that a liver transplant from a living donor is one of the most complex type of surgeries to carry out, as it involves the removal and transplant of part of the donor's organ. "Liver transplantation is a last resort option, because it is very difficult to find a deceased donor," said Dr. Antonio Pena, a consultant doctor at the Institute of Gastroenterology at the hospital. "Our ability to add the liver transplant option from a live donor has helped expand the range of treatments available and give hope to patients with advanced liver failure." “A living related liver transplant is a complex procedure because our multidisciplinary teams need to perform two surgeries at the same time, safely removing part of the donor’s liver and transplanting it into the recipient. Following the surgery, both patients were closely monitored in the ICU and moved into our post-transplant recovery programme, where they continued to receive support,” he said. Waleed Ahmad Al Hadrami, the patient’s son, said: "When my sick father's condition worsened and I learned that the only thing that could save his life was a liver transplant, I did not hesitate to donate him a portion of my organ. At first I was afraid of the operation, but my fears soon faded away when I met the doctor. And I was relieved because I would be able to do this for my father. " The patient, who is the father of nine children, said he was grateful to be surrounded by his family and parents during the recuperation process, adding that the surgery not only helped improve his health but also contributed to his family’s wellbeing.